Neil had not been "sitting comfortably" for months. We had moved away from all our friends in London to be nearer family, as we knew we were going to need the help. Family, however, was spread between Neil’s in Leeds and mine in Edinburgh, so we had moved somewhere in between, to a house that would accommodate all our needs (no easy task) and managed to land ourselves in a town where we knew nobody. Being able to keep in touch was getting more and more difficult, but for the sake of our sanity was becoming more and more important. When my brother first suggested writing a blog, it sounded like a good idea: we could update everyone at the same time, let them know how we were doing without them having to ask, and they could post comments as a reply. Neil was instantly keen. Hello to all visitors to our new blog and welcome to The Plattitude. For those who don’t know us, The Plattitude has been created to help us tell our story, a tale of fun and laughs with a smattering of upset and devastation. I'm Neil, proud husband of Louise and dad to 10 month old Oscar. 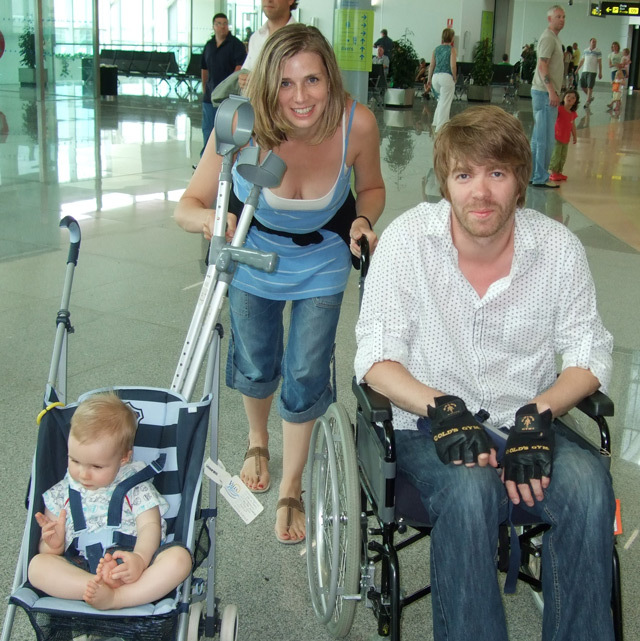 In February of this year I had the untimely misfortune of being diagnosed with Motor Neurone Disease at the age of 33. As you can imagine, quite a lot has changed since then and I felt the need to try and write some of it down. So, if you can bear with me long enough, I’ll tell you our story and feel free to interrupt with as many questions and comments as you like. → Next post: Birthday Week! Hi Neil & Louise! This is a very good idea, and we will forward the address to the NCT crew. We miss you both terribly. And wish we were closer in order to share the exciting development moments of our children as well to help you two out. Please let us know if there is anything, anything at all, that can help. Love! Michelle & Tony. Kisses to Oscar from lil’ Maia! Had a great weekend, what a top Birthday party! Still hungover but that’s because of our kid and Cork gin. Just to let you know the site works fine on a mac. Give us a ring if you need anything, hopefully see you at the weekend (will buzz you in the week). Big love to you all and lots of bounces for Oz pants. dude, what a great idea! Just to let you know this is a great idea and that we both admire the way you are both handling this horrible situation. As Louise so rightly states the MP’s and other supposedly ‘do gooders’ really don’t know what they are talking about and would surely think differently if it happened to them or their families! We wish we could get to see you more often but we know that you have loads of friends and other members of family with you. But if you do need anything at no matter what time of day or night just give us a bell. your message came totally out of the blue the other week and I am still lost for words as to what to say to you…I’ll probably write a song about it…pull those guitar strings, give me a head start…my heart goes out to you and your loved ones, you’ve always been such an active, fun-loving guy, I can’t imagine you stitting still for 5 minutes! Congrats on little Oscar!!! My littlest one is almost 5 and certainly keeps me on my toes. I wish I wasn’t on the other side of the planet to keep in touch more often, make some music, I need a couple of tunes more for the album, any ideas? Pls remember you’re often in my thoughts, those band years were the best!!!! Talk again, soon! Say ‘hi’ to Steve and his family, too! Hi Neil, Just started reading your stuff (STUFF!! what a way to describe something that you’re passionately writing anout) Can you imagine?….Hi Mr Shakespeare, just been looking at some of you’re stuff. Subtlety has never been my strong point, nor spelling. Is that how you spell subtlety? Anyway, I hope things are good with you just now. I’ll keep it short, cause if I don’t i’ll start writing all sorts of shite. (like, I huvnae already). I tend to write, like I talk….pish!! Right..I’m off to read the rest o yir stuff. P.S. Send my love to that lovely, lovely wife of yours. Doh! See what I mean I cannae even spell ABOUT. Terry is here to day and he told me about your site and I am now sitting here in pieces having read your web site. I send you all my love and warmest wishes. Hey Neil, I’ve only just heard your news and even though it’s been over 10 years since we may have seen each other in college, (or a pub near it!!) i’m utterly shocked. I have to say though that reading through the website i’m astounded by the strength and determination you have in such a valid cause of promoting awareness – it’s such a good idea and the fact you’re doing it is a beacon of light itself. As it’s been so long – congratulations on your marriage to Louise and for the wee man Oscar himself! i hope you don’t mind me writing to you,but i just wanted to say thankyou,for writing this blog.My husband spent 24 days in a hospice and i wrote a daily blog on the oral cancer foundation website.The blog was about my emotions and feelings during this time leading up to his death.your blog is your emotions during your time,and it has given me so much insight into how rob may have been feeling.i never had any idea what it was like for him i could never imagine,he seemed so resigned and accepting ,and that was strange to me.he got very angry on occasions,but overall it was the closest we had ever been. He died on july 29th 2007 at the age of 44,just 24 days after being told his condition was terminal. In January 2008 i started working as a volunteer at Saint Michaels I am an admin assistant in the communications department.I needed to do something for the wonderful facility that does so very much for both patients and their families.The hospice Rob died in was a magical safe place,just like Saint Michaels,and i thank god for it every day of my life ,and once again i thank you for sharing your journey with us ,and helping me to appreiate theother persons point of view. I heard the news recently and wanted to write to you but was totally lost for words. It has been a long time since we saw each other (over 7 years at least!). We met back in the good old days of the Bank House Hotel. I am going back to Wakefield for a flying visit this weekend and I was thinking about when you used to get your guitar out for a good old sing song on one of the many nights out/in! I just wanted to say how devasted I am to hear this news. I am outstanded by the strength that you show and wish you, Louise and Oscar all the love in the world. My family live in Leven Fife so we are close to Pittenweem. I just read Neil’s story in the paper today (19 June). I knew there was a young man who lived along the coast had been diagnosed with Motor Neurones. How ? My Mum was diagnosed with Motor Neurones Disease, Bulbar Palsy variant which is very aggressive in Feb 2008, the same month as Neil ironically. She was ill from Sept 07 and was frequently at the Doctors but they thought it was loads of other things before they finally performed all the tests, this was after I went with Mum and pleaded with the Doctor to refer my Mum. As you probably know they eliminated everything else and finally decided on Motor Neurones Disease, our world fell from our feet. She kept her mobility almost right to then but she was affected in a cruel way too, she could not eat, drink or speak from around March 2008, she ate and drank via a PEG from this time. She died in 18 Feb this year only a young 73 year old women who had previously been very fit, healthy and happy prior to the diagnosis, we are all still devastated at our loss, so I can imagine how it is for you. If there is anything that I can do to support your work, please do not hesitate to contact me. I admire what you are going to do as this is an illness that most people do not understand, especially the cruelty of the brain being active and, I can confirm that my Mum did feel trapped.